Tom recieved an 87%, 92%, 77%, and 90% on his 4 exams. Find the mean of these scores. To find the mean of a certain set of numbers we need to add all enteries together and then divide by how many numbers you have. Karen wants to get an average of 92% at the end of the semester in her class. She has 1 test left to take before the semester is over to raise her average. If she recieved an 88%, 87%, 95%, and 93% on her tests what does she need to recieve on her last test to obtain the 92% average? For this question we need to set up an equation to find the mean, set it equal to our desired mean of 92 and solve for our missing test value. Clara recieved 10 apples on Monday, 9 apples on Tuesday, and 5 apples on Wednesday. What was the average number of apples she recieved? On her past five tests, Julie scored . What was the mean of her scores? The following stem and leaf plot illustrates the number of baseball cards owned by a group of friends. What is the average number of baseball cards that each individual owns? First, write out the individual values found within this stem and leaf plot to figure out how many values there are. In order for Michael to get a "B" in his trigonometry class, he needs to have an average of on all his tests. He has one test remaining. His scores on his previous tests are . What score does Michael need on his last test to get a "B"? Now, let be the score Michael needs on his last test in order to have a test average of . The average temperature for a city is given by the following graph. 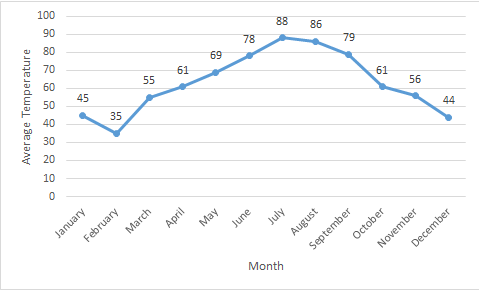 What is the average temperature for the months of May-September? First, figure out the temperatures. The mean of is . Find the value of . The mean of is . Find the value of the smallest number. Now, because the question asks you to find the smallest number, you need to find the value of . The average of is . Find the value of the largest number. Now, because the question asks you to find the largest number, we need to find the value of .